Thai designer Thunyatorn Ng applies make-up to a model. When Thunyatorn “Cheng” Ng speaks about Thai fashion and style, she tears up. The 34-year-old Connecticut-based fashion entrepreneur and stylist specializes in creating traditional Thai outfits and costumes. Her designs were showcased during this month’s New York Fashion Week, at an event September 10 hosted by the Council of Aspiring American Fashion Designers at the Pier59 Studios in the Chelsea Piers complex on the Hudson River. Ng prepared her show, featuring headpieces themed to the Chinese zodiac, in just seven days, after a spot came open. “It was the biggest show of my life, so far,” in terms of attendance, she said. “I have to confess: I never thought it’d come to a point where I’d do New York Fashion Week with my clothes,” said Ng of an event known for launching and accelerating careers. Thai designer Thunyatorn Ng at her first New York Fashion Week in 2017. Ng’s styles shown on the runway were provocative and stylized, with ornate headpieces and gold accessories. The result might seem theatrical, but Ng says her designs often start with the formal clothes Thais wear on important occasions. A model wears a Naga costume designed by Thunyatorn Ng at New York Fashion Week 2018. A native of Lumphun in northern Thailand, Ng believes Thais, especially those who live overseas, should show more pride in traditional Thai clothing and fashion. Ng knows it is tough to compete with the allure of Asian cultural heavyweights like China or India, but says Thailand’s strikingly unique fashion and textiles heritage deserves more attention than they receive. “The clothes themselves are beautiful. And I’m Thai, I want to show that I am Thai,” says Ng, a graduate of Bangkok University who majored in communications and the performing arts. Ng first became interested in Thai textiles as a child, growing up surrounded by traditional silk production in northern Thailand. She renewed her interest as an adult living in the United States. That was when she realized Thai textiles and fashions had an image problem. They were so obscure as to be virtually unknown even though Thai fashion itself is partly a product of Thai kings adapting clothes from Europe, says Ng, who presented her work at New York University (NYU) during a November 2015 symposium on Southeast Asian dress and textiles, an event overseen by adjunct faculty Daniel James Cole. Ng came to the U.S. in 2009 to study English. She worked as a freelance makeup and hair stylist, and as an assistant chef. Despite her fractured schedule, she found the time to fall in love. And in 2012, even in the famously diverse and worldly New York metropolitan area, she discovered the Thai wedding clothes she wanted to wear for her marriage weren’t readily available. So she imported what she wanted, then undertook the task of customizing the garments, realizing stitch by painstaking stitch, that she held in her hands the underpinnings of her niche business. Examples of traditional Thai items by designer Thunyatorn Ng, who works to recreate Thai weddings in the U.S.
For years, Ng ran Thunyatorn LLC from her home basement studio in Elmhurst, Queens, a New York City neighborhood. She imported, modified and designed Thai clothes for weddings or other formal occasions for clients in the eastern half of the U.S. She is now based in the New York suburb of Greenwich, Connecticut, where she also owns a day spa. Clients fly her in and put her up in their homes, all to have her help realize a Thai wedding, a service that only a handful of U.S. companies can provide, nationwide. At her busiest, Ng makes four out-of-state trips in a month for clients, handling hair, makeup, clothing, and even providing Thai wedding gear like ceremonial water tables. Chuthaphorn Sricharoenta in a red Thai dress made by Thunyatorn Ng. Chuthaphorn “Gai” Sricharoenta was one of Ng’s brides. Sricharoenta works at Yale University’s health care services group, which includes the dining hall and dietary aid divisions. She met Joseph Weems online. He’s an executive chef at New York-Presbyterian Hospital in New York City. The couple had their first date at a Thai restaurant, on New Year’s Eve in 2014. 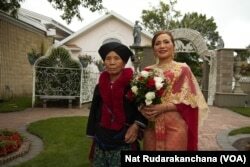 Sricharoenta wanted a Thai wedding for her second marriage. She decked out her two half-Thai children in clothes rented from Ng, while her 68-year-old mother flew in from Chiangrai for the wedding, July 22 near New Haven, Connecticut. “I want to showcase what it is to be Thai. I also want my American friends, my colleagues and others, to understand Thai culture,” said Sricharoenta, 44, a Chiangrai native, hours before her wedding ceremony. Weems supported his wife’s desire to share her culture on their big day. “I like diversity. I embrace diversity, and this is a way of bringing a lot of people together, with diverse cultures. So this [Thai wedding] is a great thing,” said Weems, a 58-year-old Lancaster, Pennsylvania, native who wore a cream outfit, with Thai pants rented from Ng. Non-Thais wearing Thai dress, including traditional outfits, “is not something strange or offensive. It’s just that the world isn’t used to it … people know more about Thai food than about Thai fashion,” Ng said. Ng believes Thais are much more sensitive about foreigners who misinterpret Thai religion than non-Thais who wear Thai clothing. “Fashion is more about your individual personality,” and what a person feels comfortable with, while religious customs are more about respecting tradition, said Ng. Have the best of VOA News delivered directly to your inbox each day. Subscribe now.